It feels like spring! Warmer temps, rain and mud! I bet many of you can relate to the new mani and the jean look. 🙂 I am in seventh heaven to be honest! Gratefulness was the them of Ginger’s post last week on Five Random Things that Make Me Happy. I really love the card her hubby made her! Beautiful! And the Cute Repurposed Denim Fabric Baskets from Taylor Made were adorable! Maybe my jeans above need repurposing! Let’s get hopping so we can share! Brag a bit on yourself and on your great farmgirl skills and passions! With spring around the corner I know you are up to lots of fun and creative things. Please share what you are up to! I have much to learn from you! We are at the Indiana Small Farm Conference and are so excited to be here. Ever since we bought our property we have dreamed of what we could do with our land. We have more ideas than we know what to do with! This conference will assist us in clarifying some of our dreams and in providing some concrete ideas for how to get there! Many wonderful link ups from last week. My favorite (gosh it is always hard to choose! ), is 10 Garden Chores I Should Have Done Last Fall. It is a great list to save for this fall. AND let’s just say misery loves company LOL! I was much better at clean up this past fall than I was Fall 2014, but there were plenty of items remaining. Thank you Kim for sharing! Let’s get to the hop! Brag a bit on yourself and on your great farmgirl skills and passions! With spring around the corner you must be busy, busy, busy! Please share what you are up to! I am so excited!! I am starting seeds this weekend on my new grow shelves that hubby is putting together for me. Lights are being added as I type here and by the end of the weekend I will have some lovely little green babies just waiting to pop! Do you have spring fever too? Last week I loved reading (and dreaming while reading) A Miniature Orchard, by Dogwood Lane Rambles. We have no fruit trees and we fantasize about having them. 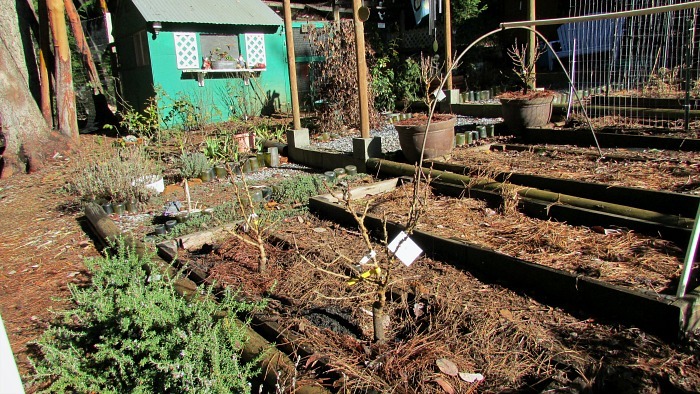 I loved seeing the photos in this blog and the terrific looking soil they have! Brag a bit on yourself and on your great farmgirl skills and passions! Deb has graciously allowed me to continue on as the Farmgirl Friday Blog Hop hostess! We have had so much fun sharing in the previous 210 blog hops, let’s keep it going shall we? Do you like the new logo? I think she is darn cute! He had doubled over in pain that morning at the gym and the scan revealed he had a KIDNEY STONE! YIKES! For those of you that have experienced this my sympathy is with you. I have never seen such pain in a man; and to see it in a man that never even takes a Tylenol was a little disconcerting for me to say the least. Good news is that he passed it on Monday night. The little sucker looked like a dry black bean. My hubby loves Mexican food so we have had some laughs over the fact that only he would have a kidney stone that looked like this. We are very grateful that this was short lived and over! So I have been dreaming of gardening. We have our cold frames that have kept us in greens all winter so far. BUT spring is around the corner and lots to be done. We got some shelving for our little green babies and oh the catalogs… who can resist??? I love saving seeds but the downside is that I don’t need to order seeds! What’s a farmgirl to do? Order more seeds of course! What’s your favorite thing to grow? I am asked this and I say tomatoes! And then I say green beans! And then I say peppers! And then I say squash! And then I say lettuce, beets, carrots, radishes, peas, pumpkins, kale…. well you get the idea. How can you say what is your favorite? That is like saying who your favorite child is or chicken or goat is… really???? Who can do that? I am looking for a CO-HOST! Who would love to do this with me? Please leave a comment or PM me on FB. I am wanting desperately to partner with 1 or 2 or 3 other farmgirls to host this. It is fun and easy. Please consider and let me know if you might like to do this. I want to highlight favorites again on a weekly basis. It would be fun to have a couple of us doing that. And giveaways are a part of 2016! I love a giveaway don’t you? To refresh, this is easy! Here are some simple guidelines! Enter up to three entries per hop! Don’t be shy! This newbie farmgirl learns soooo much from all of you! Please round up your best of the week and share it here! Welcome to Farmgirl Friday Blog Hop and welcome to December! Can you believe that it is December? Are you crafting, baking and fitting in some relax and enjoy time as well??? Deb is crafting! She is sharing such cute Canning Jar Lid ornaments with us today! You MUST head over and check them out! AND congrats to Daisy of Maple Hill Farm Blogspot! She won the note card giveaway! Way to go Daisy! We are slimming down the Christmas decorating since we are kitchen remodeling- there are only so many hours in the day, right? We did get our tree however this week and I have a couple of Christmas favs around the house. Deb did mention that we are still eating fresh tomatoes here! Can you believe it? She hinted about wanting a quiche recipe that I made this week. Well, I must confess that it is not my own, but it is AMAZING and you can get it here! I did sub out the arugula for mizuna. I have them both growing in my cold frame and picked the wrong one so I used what I had. It was sooooo good! Take a break from your holiday prep and share what you are up to! Thanks, as always for joining in! Welcome to Farmgirl Friday Blog Hop! Deb has a great giveaway. Adorable Note cards! Are they not the cutest? Head over, say Hi to Deb and see how to win. It is easy, peasy! 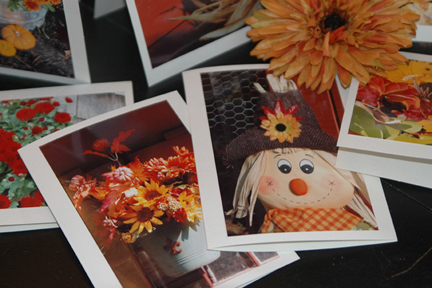 Are you getting ready for Thanksgiving? Does your kitchen smell of freshly baked pumpkin pie? Are you planning wonderful side dishes? Do you raise your own turkey or do you get it from a farmer nearby? Our kitchen is in prep mode, but not for Thanksgiving cooking…Do you see a fridge or stove? We are smack dab in the middle of our kitchen remodel and there are no appliances in sight. But sanding is going on tonight on our wood floors. They will be beautiful by the end of the weekend. Then we must leave for 7 days so they will cure. So we will head to my mom’s and dad’s for a lower key celebration and hopefully cook up a storm for Christmas! Whatever you are doing have a blessed Thanksgiving. I hope you spend it with people you love and I hope you have much gratitude in your heart. Happy Thanksgiving! Now, go visit Deb, enter to win and join in the blog hop! Fall is in the air here – 57 degrees this morning! I loved it, but I really need more hot days to turn my tomatoes from green to red! This time of year has me dreaming of fall- cooler temperatures, time in my craft room, fall gardening… BUT it is still August and I have green beans, basil, peppers and tomatoes in full swing. And grass still to cut. Fall is approaching but my world is still full of summertime. Deb is in the same mode— she is dreaming of painting and crafting but still has gorgeous blooms and Farmer’s Markets to come. How about you? Fall or Summer or somewhere in between? Stop by and visit Deb to say hello. We hope you join in and share your antics. Let’s get hopping! Have a great weekend regardless of the season you are feeling! 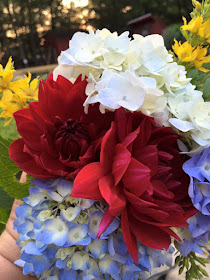 Welcome to Farmgirl Friday Blog Hop #202 AND Happy 4th of July! This photograph from Deb’s blog today was so beautiful that I just had to “steal” it and share it. It really screams out celebration doesn’t it? We are visiting our youngest for the holiday. We will be swimming, eating, watching fireworks and probably competing in a mean game of putt putt. What are your plans? If you love flowers Deb has some great information on American Flower Week and how you can participate. I wish I had a green thumb in that regard, but maybe that is something in my future! I hope you have a wonderful holiday weekend with your family and a chance to reflect on the freedoms we have in our great country. I also hope you have a little bit of time to blog hop with us! Brag a bit on what’s happening your way. I learn so much every week just reading these. I have so much yet to experience!!! Thanks for joining in and be sure to stop by Deb’s and Dandelion House! 200th Farmgirl Friday Blog Hop Anniversary AND Giveaway! WOW! 200th Farmgirl Friday Blog Hop! Some of you have been here since hop #1 and some (like me) joined in sometime between then and now. Whenever you started hopping with us, we are just glad you did! Every week we have such an array of great blogs, tips, fun and creativity. 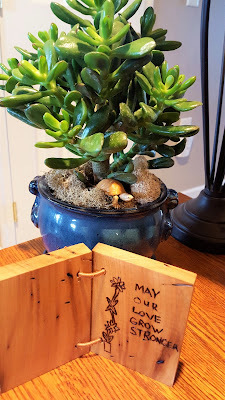 Deb and I love reading them and feeling connected to you all. Hop over to Deb’s to see where her inspiration came from for our blog hop (I am sure many of you can guess it is MaryJane Butters). She inspired Deb to start our blog hop. 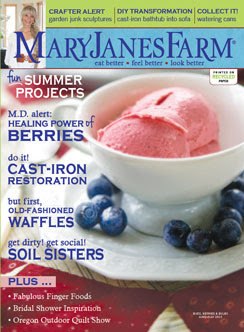 A little known fact is that when we decided to move to the country the very first magazine I bought was a MaryJanesFarm Magazine. I had never heard of this magazine in the “city” but I ate it up–every page and have been a loyal reader and part of the Farmgirl Sisterhood ever since. So it only makes sense that on this, our 200th Farmgirl Friday Blog Hop that Deb and I are giving away TWO 1 year subscriptions to MaryJanesFarm Magazine! Do I hear a YIPEE?? What about you? Visit Deb and I and leave your antic! Good Luck! Welcome to the 199th Farmgirl Friday Blog Hop! Can you believe that we are about to hit 200???? Deb and I have a surprise for you on #200! Deb has been harvesting rhubarb and she has a fabulous pie recipe (and beautiful picture) that she is sharing. Stop over and say hi and take a peak! What have you been up to this week? Come on and share your doin’s!